When Erik Palmer started his doctoral degree in mathematics at the University of South Carolina, he did not know what his focus would be. For the first few years, Palmer concentrated on passing his exams and adjusting to life as a doctoral student. When it was time for Palmer to decide on a topic for his thesis, a serious event came crashing into Palmer’s life—the premature birth of his son. As Palmer would soon learn, lungs are one of the last organs to develop in babies. His son needed medicine to improve the lubricating qualities of lung mucus to help him breathe. After more than two weeks in intensive care, Palmer’s son came home, and Palmer had identified his thesis topic. He became dedicated to developing mathematical models capable of reproducing the behavior of human lung mucus, using computational fluid dynamics. As his research progressed, Palmer sought to improve the performance and capabilities of his models. To do so, he needed more experience and access to high-performance computing tools. 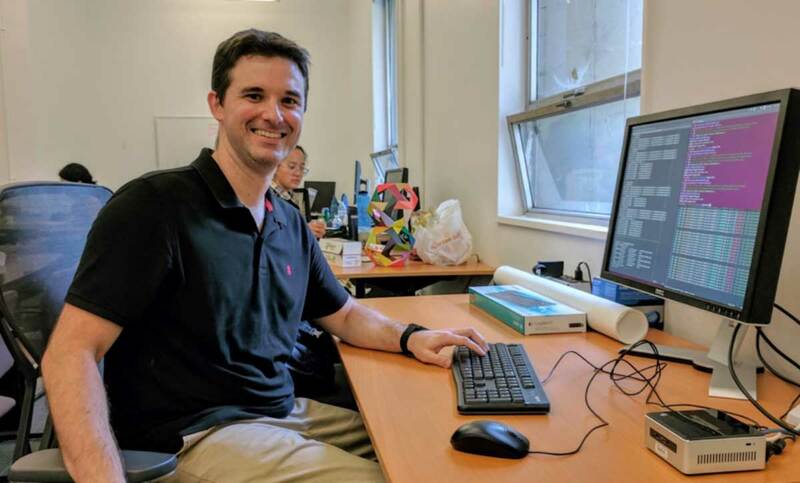 Searching for such an opportunity, Palmer turned to the National Science Foundation’s (NSF) Mathematical Sciences Graduate Internship (MSGI) Program. Palmer returned to his birthplace of Berkeley, California, to conduct research on multiphase flow at the Lawrence Berkeley National Laboratory. Multiphase flow is the movement of materials with different states or phases. This movement is common in nature, and it is also used in industries like energy production, pharmaceuticals and chemical processing. With his mentors Andy Nonaka, Ph.D., and Ann Almgren, Ph.D., Palmer investigated the combination of fluid flow simulation with particle movement to create a single model that would be capable of modeling particle effects on fluid behavior. Palmer focused on studying discrete element particle collision tracking methods in order to determine which method is the most effective. Palmer analyzed pertinent mathematical equations, created software prototypes, and implemented an effective solution. The proposed method was verified by generating a successful simulation of particles in fluid, which provided a promising step forward to improve modeling methods. The research was conducted as part of the U.S. Department of Energy’s Exascale Computing Project (ECP), which was established to maximize the benefits for the next generation of computing systems. As technology improves and computers become faster, enhanced code is needed to accompany the changes in technology and enrich the scientific value. Multiphase flow models, which are ubiquitous in countless applications, are an important part of coding and technology improvements. For medical devices, improved multiphase flow models can improve drug dosage and delivery methods. For Palmer, the experience revealed new career opportunities and brought personal meaning. “The environment of open, friendly and common exchange of knowledge was truly wonderful. I gained a long list of skills that will help my Ph.D. studies as well as make me a more marketable candidate across a variety of fields and industries in the future,” Palmer said. Palmer returned to the University of South Carolina to complete his doctoral degree in 2018. Following his graduation, he plans to look for a research position at a national lab.